I’ve written an unusually high number of unit tests for the Java portion of Waffle, mostly because the project became popular really fast with all those Java people trying to do Windows authentication. Some have succeeded and some filed several rather complicated bug reports that dealt with concurrency, sessions across HTTP requests, etc. It all needed to be unit-tested in order to make industrial-grade software. If you asked me yesterday, I would have said that Waffle unit tests cover 99% of the code. But Emma says otherwise, and it’s probably right. It took me half an hour to integrate Emma. Pretty easy. You should do it too. I downloaded Emma from http://emma.sourceforge.net and added it to ThirdParty/emma. What I want next is a cover target that can execute all unit tests with code coverage. We’re doing this in ANT with JUnit. I went the route of not changing my build tasks and instrumenting the .class files already built. Then I swap in those files with the instrumented ones. Note that Emma only generates .class files for instrumentable classes – those not containing debugging information, interface definitions and such aren’t included. The tests are run the same way as before, but we need to tell Emma where to write its output. Finally, we want to get a nice HTML document that summarizes coverage. I see a lot of red. Emma doesn’t think I am doing such a great job after-all. 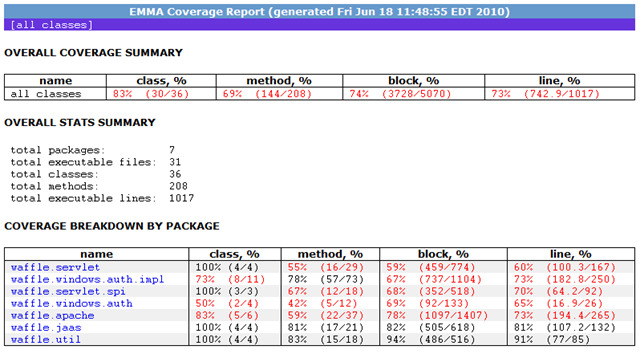 Code Coverage with EMMA was published on June 18, 2010 . See a typo?